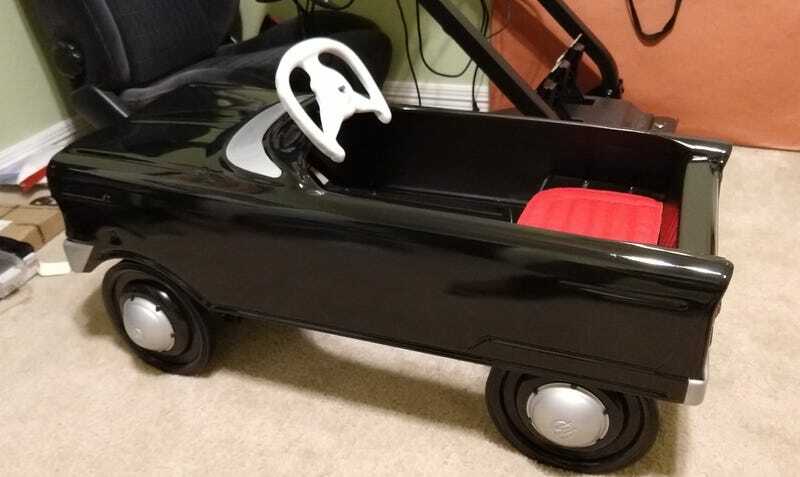 Finished the restoration of a 1960-1967 Murray V Front Pedal Car. Took it down to bare metal, straightened the body as best I could before respraying it. Then added new rubber tires and seat pad. It was a fun project. I donated it today for a local charity auction. Sanding down to the bare metal. After soda blast on the left and after soda blast & wire brush on the right. Masking off the chrome to apply the black base coat. Wheels and hubs painted and new tires mounted. Applying second clear coat. I really like how the tail lights came out. “Chrome” base color with a metallic red tint over top.